This year marks the 30th anniversary of the introduction of GLOCK pistols to the U. S. market. GLOCK, Inc., was established in the United States in 1986 and revolutionized the firearms market forever. GLOCK pistols are now the sidearm of choice for over 65 percent of the law enforcement agencies across the U.S., and they are used in more than 50 elite military units worldwide. 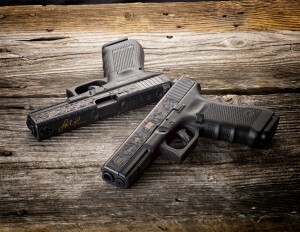 GLOCK has launched a year-long 30th Anniversary celebration. GLOCK has commissioned a limited edition of thirty hand-engraved G17 Gen4 pistols to honor groups and organizations that have contributed to the overall success of the company in the U.S.
Each of the thirty pistols has been uniquely by one of five Master Engravers who have been certified by the Firearms Engravers Guild of America (FEGA) to commemorate the relationships cultivated during the company’s thirty-year history. The exclusive pistols will be presented throughout the year to exceptional individuals and organizations that have made significant contributions to the success of GLOCK. The engraved G17 Gen4 pistols carry a limited production serial number and come with a certificate of authenticity signed by Mr. Glock. The pistols will be presented throughout 2016. To learn more about 30 years of GLOCK in the United States and how to win one of the limited edition pistols, visit 30th.glock.com.